Cappella di Sant'Andrea - Archbishop Andreas palace chapel - Cappella di Sant’Andrea all’interno del Museo Arcivescovile - Cappella Arcivescovile, also called the Cappella di Sant'Andrea. 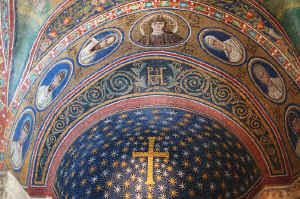 The Archiepiscopal Chapel is a chapel on the first floor of the bishops' palace in Ravenna, Italy. It is a private oratory of Trinitarian bishops dating from the turn of the 6 C. Although commonly attributed to St. Peter Chrysologus, Archbishop of Ravenna from 433–450, the chapel was actually built by Peter II shortly after he became archbishop in 495. The tiny cruciform chapel is currently dedicated to Saint Andrew, although the original dedication was to the Saviour, as evidenced by a lunette over the vestibule door representing Christ as a warrior. 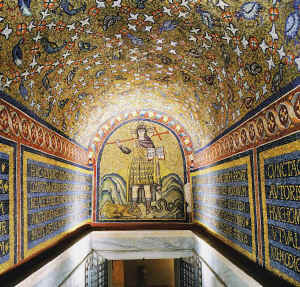 The lower parts of the walls are lined with marble slabs, while the rest of the interior used to be covered with rich, tapestry-like mosaics. Some parts of these survive, while others were substituted with tempera paintings by Luca Longhi in the 16 C.
The Cappella di Sant'Andrea is the only Early Christian private oratory to have survived to the present day. Its iconography is also important by virtue of its strongly anti-Arian symbolism.